Sales and marketing teams have been at the forefront of leveraging big data and analytics to target and convert customers. But for all the heavy-duty data science in use, it’s ironic that company firmographics data, that old workhorse of list generation, hasn’t really evolved. Compile’s business data makes company firmographics analytics ready. Beyond the basic segmentation information, we track shallow news alerts, deep triggers and unstructured blobs for every company. But what really enables interesting analysis is our Business Entity graph. The graph is dynamically updated map that links a rich set of attributes for a company in a structured form. The graph structure allows the user to query the system with any combination of inputs. But instead of describing the graph in long paragraphs and large numbers (millions of companies, billions of signals, trillions of documents…), let’s look at a real-world application. For technology vendors, knowing the I.T. products used by their prospects can be quite useful. The graph below shows the distribution of web-facing technologies (i.e. 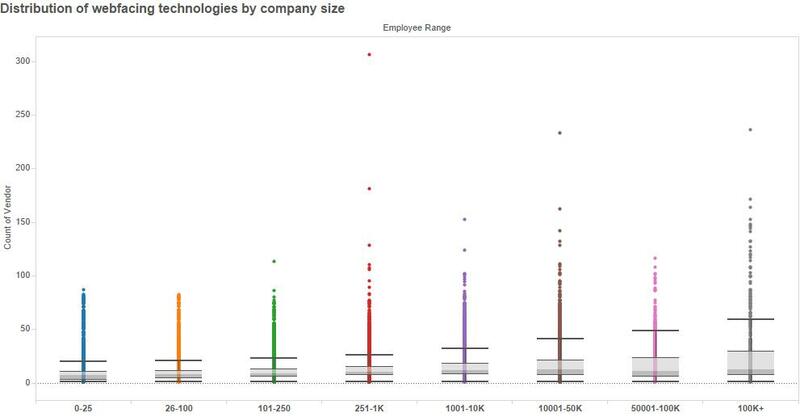 technologies that are visible by analyzing a company’s website) for all companies in our dB by company size. The graph isn’t very surprising - as the company size increases, the median number technologies steadily rises. The second graph further segments the type of technologies in use by industry type (only few are shown). While the graph itself is very detailed, what is interesting to note is that the tech usage broadly follows the same pattern as above follows. 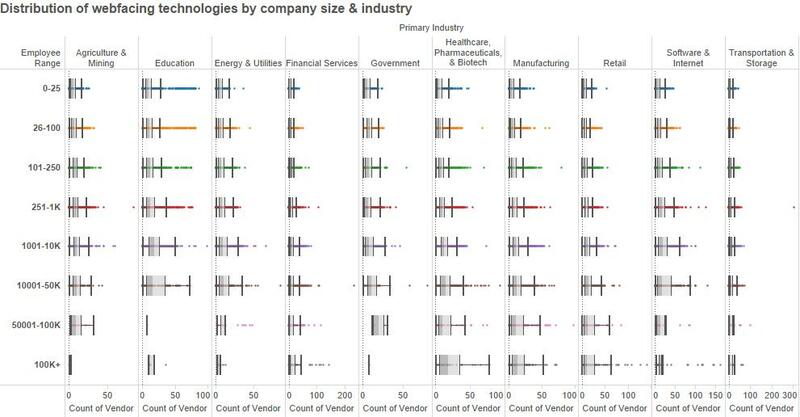 To first degree, regardless of which industry, the number of technologies in use, depends on a company’s size. The two graphs above highlight the reality of data: without context, data, however interesting, has limited value. For instance just knowing that a customer is has salesforce.com CRM doesn’t imply that they’ll be open to a pitch from a marketing automation vendor. We’ll need to know more about the customers, either from past behavior or from patterns they emit, to make a judgement. The third graph below combines the tech install data, with linked firmographic information to compute a SaaS adoption index. 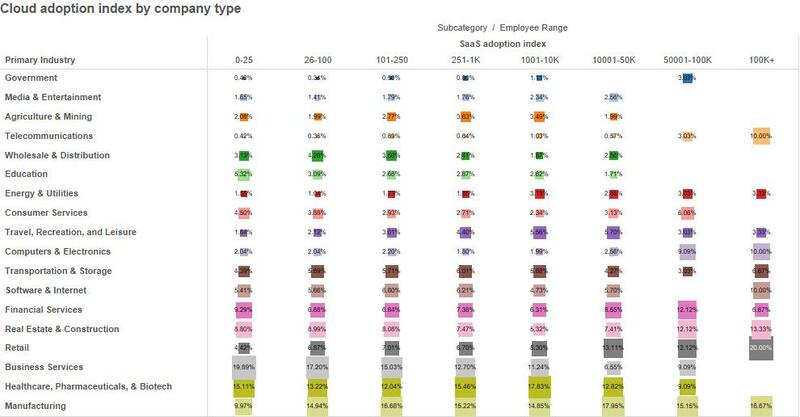 The SaaS adoption index is based on how quickly or deeply a company is leveraging SaaS tools. So, for instance, the presence of salesforce.com isn’t a great indicator of SaaS adoption anymore since the penetration is high, the use of Optimizely or some such tools indicates an organization comfortable with SaaS tools and investing in marketing automation. The actual algorithm is more complex than that; it merges multiple data-points per company including signals, growth indicators, R&D spend etc. to compute the score. How is this useful? Triggering marketing actions based on the type of technology used by a customer is good, but the efficacy is limited. By layering in additional signals about an organization, it is possible to separate the signal from the noise and focus only on the prospects that exhibit purchasing patterns. Individual data sets = good. A linked entity graph that can identify patterns across disparate data sets = better.